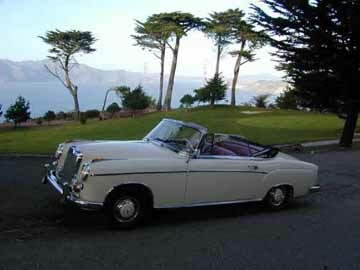 LUE is a 1957 Mercedes-Benz 220S cabriolet, one of 2,178 made from 1956-1959. She is called "LUE" due to her California license plate "LUE 435." 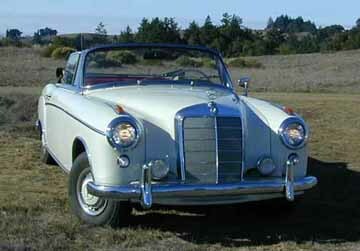 Her "Mercedes-Benz Karosserie" tag lists her as "A180.030-7500545" meaning she was the 545th W180 chassis started in 1957. The W180 chassis includes sedans, coupés and cabriolets. 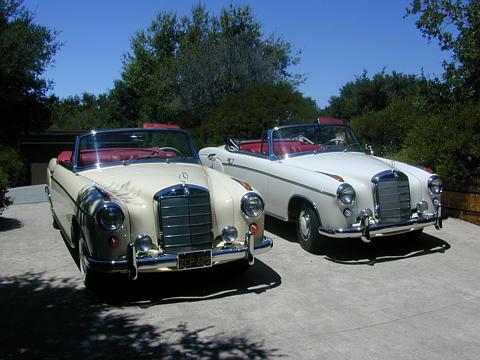 The 220S cabriolet may be considered the queen of the "Pontons", Ponton being the name applied to a body style started in 1953 by Mercedes-Benz, and continued through 1962. Pontons are also called "roundies", "bowlers" or "turtlebacks" in different countries, due to the distinctive body style of the sedans. There are two theories as to why these cars were called Pontons. The first is that the term ponton (German for pontoon) made reference to the fact that in 1953, the appearance of these cars did not seem to follow the pre-WWII design evolution. For example, the headlamps, which had been mounted atop large free-standing fenders on earlier models, were now being integrated into the fenders, which themselves had become part of the whole body. The second theory stems from the fact that at the time of manufacture, the real novelty of the car lay in its stressed unit-construction shell. This shell made it stronger and lighter than its predecessors. At the front of this, there was a separate U-shaped sub-frame, rubber mounted to the shell at three points. It held the engine, gearbox, suspension and recirculating ball steering. One journalist is reported to have compared this design to a pontoon bridge, and this led to the cars being known as the Ponton Mercedes. 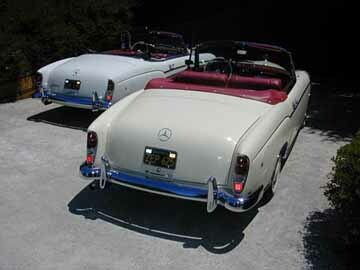 What is a Ponton Cabriolet? 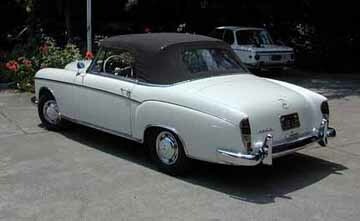 While the Ponton cabriolet appears to be another style altogether, it retains almost exactly the same features from the window sills down, but its raked windshield and low slung style make it appear more Rolls Royce in nature than Mercedes-Benz. The Ponton coupés and cabriolets both cost $7,700 in 1958, equivalent to a Cadillac Eldorado Biarritz, which was the most luxurious car America had to offer at the time. The Cadillac screamed "modern" and had exotic styling with large tailfins and stainless steel accents, while the Mercedes was more old fashioned, less trendy, more traditional. 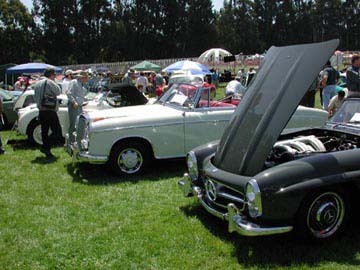 The coupés and cabriolets were special cars, even in 1957. Made on a separate line, away from the production sedan cars, the amount of trim is exemplary. Stunning wrap around wood trim was standard in Walnut, like that found on LUE, or could be ordered in many other varieties, bird's eye maple being only one stunning option which could be ordered. Each piece of wood is burned with the Karosserie number (545 for LUE) for that car, as each piece was shaped on the line, then taken away for finishing before final installation back on the line. Many other hand finished details exist on these extraordinary cars. Now that you know where she came from, LUE is a hand built car, but not really a collectible in the most exclusive sense of the word, since more than 2,000 were built. But in general terms she is pretty rare, especially since these cars were shipped around the world when new. We are aware of good examples all over the US, South America, South Africa, India, Australia and Asia. A disproportionate share of them have found their way to California, and remained in good condition. We are aware of at least 10 nice examples in the state. Most of these cars have been well taken care of, due to their rarity and each owner's love for them. LUE is not even the nicest one we have seen in California. 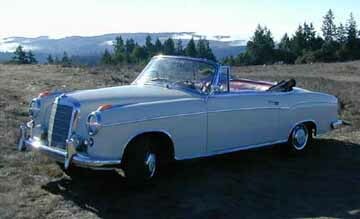 She is about a 2.5 on the 6 point scale, and is mostly original, including the interior, but not the carpet or top. She has just over 100,000 original documented miles. About two years. It's a nice story. When Eva and I decided to get married, among our 'pre-nuptial' discussions included my desire for a picnic car. 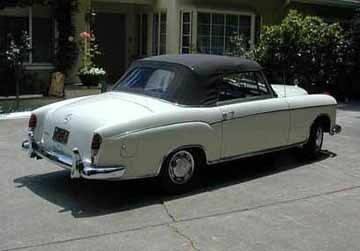 This was to be a large 4 seat MB cabriolet, a 280SE or 3.5 from the finback era of the Sixties. I told her that when the right car came along, we would know it, and I would not want a lot of discussion at that point. Cars like this, in this condition, do not come along very often. When the time came, I wanted to pounce. She agreed completely, I proposed a few weeks later, and she agreed to that too. It was only 4 days later that we first saw LUE, parked on the street in Woodside. We did a big double take, pulled over immediately and did our best to figure out what she was. Soon enough the driver appeared out of the bank, and an eight month negotiation started. LUE had been purchased 20 years before as a wedding present for the previous owners. Selling the car had not been discussed, but here we were, and we wanted to buy her as a wedding present for ourselves. A week after our marriage, she was ours. con.cours d'e.le.gance / French concours d'Elegance, literally, competition of elegance: a show or contest of vehicles and accessories in which the entries are judged chiefly on excellence of appearance and turnout. I had not felt this dumb in a long time. "Don't you think we should wash the car? You know, with soap and water?" Isaac had just said. I stood there, stunned. Four people had now spent three hours prettying the car, polishing chrome and removing and replacing, and LUE looked better than she had in years, at least the 2 years that we have owned her. I had never washed the car in those years, never turned a hose on her, and it had become a point of pride for me. "Never washed her, ha ha ha!" I would declare, with a fat cat chortle. "She's not going to look good unless we wash her", Isaac repeated for emphasis. This was Friday night, two days before the Hillsborough Concours d'Elegance, when we had our first visit from Isaac, the neighbor kid who we asked to help us at the show. He's a nice kid, interested in cars (his favorite marque is Dodge), and he has helped before with a few jobs on LUE. All the dusting items and chrome polish and such had arrived the day before, so we were ready to go get her ready. I had picked Isaac up that evening at his house in the ambulance, hoping to bestow some "coolness" on him in the eyes of his friends and neighbors. He was suitably impressed. We got home and started polishing chrome. LUE has more chrome than a lot of Biker Bars, and by the time we were done it was getting dark. I had a little bit to do with interior prettying, and putting the clock back together and back on, putting on our new German vintage plates, and Eva removed the hubcaps and did them in the kitchen sink (no chrome polish required on these, they look brand new.) During this process is when Isaac made his remark. After I recovered from a roiling sea of conflicting emotions, we all had dinner and I dropped Isaac back at his house at about 10PM. The last thing Eva and I did was give him a shirt with LUE 435 embroidered on it to wear on Concours d'Elegance day. Saturday was not Concours, day, but it was the day of the Tour d'Elegance, which sounded even better in some ways. Go to a nearby school parking lot about 10AM and then drive off for almost 100 miles around San Mateo county. Winding roads through the redwoods, one of the best sections of Highway One, the fabled Pacific Coast Highway, and some really hilly backcountry sections with lots of curves. What fun! After our work night the night before, we had a little trouble getting underway Saturday morning. But we persevered and Eva and I got the car within 2 miles of the meeting place, when, at ten minutes to ten, the handling went all funny and there was a distinctive noise from the right rear. A flat! Discovered on a very busy street, El Camino Real, and a king sized complete flat it was; NO driving possible. We were adjacent to a driveway, so the only exit was to back up like a parallel parking maneuver and leave the car on the wide sidewalk, and out of traffic. At the last minute I remembered the hubcap which would have been ruined in this stunt, and got out and removed it. Dodging the passing cars, I got back into the driver’s seat and backed up onto the sidewalk. One deep breath later I had a look around. We were parked right in front of a service garage. It was clearly closed, but there seemed to be a door open? I asked Eva to get the spare out, and she began unloading our picnic coolers and chairs. I ran in through the open door. "Hello?" There was a guy there, surprised to see me. "We're closed. This is my car," he said, pointing to the late model Japanese sedan suspended on the hoist. "I've got something I want you to look at." I said. "We're closed." he insisted. "No, I said, I don't want you to DO anything, I just want you to look. It's worth it." He came over to the window and whistled under his breath. "Wow. What year is that? Are you going to the Concours?" "Yep," I said. "But we just got a flat tire. Can I use your floor jack?" "It's right there, he said and here's some rags." I rolled the floor jack over to the car, and jacked it up, cushioning the jack's cup with the rags. The ponton has a great big flat space just forward of the rear wheel perfect for floor jacks. Eva had the spare ready, a spare I had never thought about before, much less tested or checked. It seemed serviceable, it was the right size, and it had tread, but it had a thin whitewall, and even worse, it was nearly flat. A quick roll over about 50 feet to the open door. "Do you have air?" The tire was whisked out of my hands and onto the hose. "Thirty one pounds OK?" Yep, I said, fine. I rolled the tire back to the car, put it on, and dropped the car. I put the old tire away, as Eva already had the jack rolling back to our new best friend. I started the car she came running back and we sped away. The elapsed time of this pit stop dropped every time we told the story over the weekend. But it would never have been more than 10 minutes, and probably more like 6. We were lucky, especially with a flat spare! We made it to the tour with time to spare, time for coffee and a bagel, and a look see at the other competitors, everything from Corvettes to Jags to a 59 Buick Electra 225 to a number of Porsches and a brand new BMW Z8, plus LUE. At least 3 of the cars were not street legal, no plates and one supercharged Mustang was running on Hoosier racing tires! But the police did not seem to care. There were lots of them milling around the school yard, and then for the first few miles, blocking intersections so we could all run stop signs and get out of town quickly and in more or less one group. It was really fun. We were about in the middle of the group, behind a 1964 356SC cabriolet, and with a Zagato-bodied Alfa race car behind us. Cool. Once on the open road, the group cruised along and took photos of each other. Each car was supplied with a map of the drive and some directions which were more or less clearly explained. We tried to keep the revs up and run along with the pack and not follow too close. There were a few places where this was challenging; steep climbs followed by steep descents followed by more climbing. At the turning point, exactly halfway into the drive and at the furthest possible place from home, disaster struck. A blind hill was crested, and the realization that the caravan was stopped, stopped on Highway One, waiting to make a left turn through oncoming traffic. Cars ahead of us, sports cars, light sports cars with great brakes (in a vintage sense) were having trouble making the stop. Every other car was going onto the shoulder to create more room. I mashed the brake pedal and LUE began to burn off her speed. Slowly. It became apparent we were not going to stop in time. I was getting ready to use the shoulder when the 356SC did the same thing, to avoid crushing the gorgeous cherry red Morgan Plus 4 in front of him. He just got the Porsche stopped in time when he looked in his rearview and saw the new German License plate we had installed the night before. It was big. Too big. He quickly swung the Porsche back into the traffic lane, immediately behind the now stopped Morgan. By the time I completed the panic stop in LUE, I was halfway overlapped with the Porsche. If it had not ended this way, I could have easily pushed him--right into the Morgan! There was a little bit of silence in our car as we breathed deeply. When the other cars moved, I got back into the traffic lane and when the time came, made the left turn against the oncoming traffic. Immediately after the turn, I pulled over to the shoulder. "What's happening?" said Eva. What was happening was that the brake was not coming off. I had driven the last 100 yards, and the turn, against brakes which were not releasing. Why? I looked at the brake pedal, and it was obvious. Instead of its normal position, it was pushed over, way against the clutch pedal, stuck about halfway to the floor and sitting there at a sick angle. "Uh-oh" I said. "When I mashed the brake back there, I didn't push straight down, I pushed down and over. It's why I never really got all the braking I expected, and it's why the brake is not releasing now.” "What are we going to do?" said Eva. I was watching the classic cars go past and wanted to be with them. So I reached down and pulled the brake pedal, carefully, but not all that gently, back out and to the passenger side of the car. It seemed to straighten satisfactorily and the brake action seemed nice and the pedal came all the way back out to the same level as the clutch and so in the next gap between cars, we took off again. Me being careful to press the brake pedal DOWN, not to one side. Instead of the middle of the pack, we were now pretty deep in the group of about 50 cars. Which is why the next thing that happened was so funny. The lead car took a wrong turn at a Y in the road, and everyone followed them. It was about 1/4 mile up that road where the "NO outlet" sign was and they all stopped. We were the last car into that road, with a large gap behind us, so when we realized what happened we were able to 1) back out of the dead end onto the main road 2) quickly climb the hill to a good vantage point and 3) snap a photo of 30 classic cars trying to turn around on a one lane road. Hilarious! Best of all this put us back up with the leaders. Now we could really let LUE show her stuff, we did the hill climbs, the great sweeper turns, and the quick gear changes, now leading our friends in the 356C and chasing the Zagato Alfa's exhaust note. I only wished the Alfa was a "double bubble" car. LUE impressed everyone with her sporting ability and power on demand, through the off camber turns and with many downshifts required. And I was taking it easy, due to my questionable brake pedal! I had to reach down periodically and verify that the pedal was returning properly. To my delight, it did every time. We got back to the Tour destination, where hundreds of screaming schoolchildren greeted us with checkered flags and due to our rallye position, got the premier parking spot in front of the 1895 mansion where the post Tour party was held. A meal, and a very enjoyable few hours talking about cars with the group, and then just to pop home and get the ambulance ready for the Concours cocktail party. Concours day began bright and early, and Isaac's comment still rang in my mind. After all, we had probably picked up a fair amount of road dirt the day before. Before I took a shower myself, I found a bucket, a sponge, some light soap and turned a hose on the car, sitting there in our driveway with the top down. Careful to stay below the beltline, I started soaping and was just about done when Eva came out to do the rinse and help me dry. Afterwards, we didn't say that much, just stood there in the sun and did what we like to do, namely stare at our car. It made a difference. We drove over and picked up Isaac, in his new shirt. "You washed her!" he said immediately when he saw LUE. "You shamed me!" I said back, and we drove over to the show. Aston Martin DB3 drophead coupé. Only 84 built. Stunning perfect unique restoration, but a blinker failed on the tech-inspect! The "one week old" 300SL, owned by a guy named Bob, was stunning. He said his third place would be good news to his wife who has been skeptical of the 2.5 years and 1000+ hours of work he spent on the project. The best part was last week, when he took his son for a drive and the son said the car was sounding "real good." I think 3rd at such a nice show doesn't hurt either. He also gave me a tip regarding the braided door pulls on my cabrio. There are similar ones on the roadster. The judges were all very polite and kind and respectful and they spent as much time on LUE as they did on the other cars, which was a lot and they were even kind when I couldn't remember how to put the driving lights on at first, even helping me to figure it out so I could get full points on that section of the score. There's still a switch position there that I don't understand... oh well. The show itself, as I said, was great. Porsche was the featured marque, and I have now suffered a severe Porsche overdose. They had the usual British-accent-guy at the microphone spouting real information, along with some inanities, like "The 911 has the six cylinder engine and the 912 has only the four." Another problem for me: The Hillsborough show is held at a school, so there are no beer tents, and even our victory champagne had to be a little surreptitious. To add a little credibility, we shared it with our neighbor in the 3rd place roadster, Bob. He deserved it. Since the event was held in honor of Porsche and benefits the schools, I forgave both of them. The field where the Concours is held on is in a large bowl, with elevated viewing areas all around, so you could really take it all in, before venturing down to look at cars individually. Our class was located right in the middle of the field, with hot sun all day long. (Does anyone know which leather conditioner contains sun-block?) There were lots of different kind of cars, the best of show was a steam car made in the San Francisco Bay Area, which looked like the long gangster car from Wacky Racers, and which departs on Saturday in the California Mille. What a great car! For entrants, the scene was beautiful, from the usual "cop directing traffic away from the show steps aside to let LUE pass" moment to our warm greeting and goodie bag presentation. A guy in a blazer escorted us to our group and helped us line up, another volunteer introduced her as our "gofer for the day", and quickly corralled the coffee and bagel cart over to us (Thanks Laurie!). She came to check up on us frequently and later invited us to the "winners only party held at a secret location." Unfortunately, we were way too tired at that point to attend. We just wanted to drive home to go to the hot tub. As I said, it was clear from the beginning that we did not belong, as LUE is not really a Concours prepared car. And she probably will not be at the level required to win this show for a long time. But we had a lot of fun anyway. LUE is just such an elegant car, with such great lines that a little patina doesn't really hurt her. We had just as many lookers and photo takers and people who wanted to chat us up as anyone. Was I glad we did it? Oh, yes. It isn't often that you get to come to a top show like this one, and while we weren't really up to the standard of the show, at least in our class (2.5 is what we rate, and these cars in our class were 1.5 raters mostly) But the main thing is, we had fun. My wife looked her fabulous self in an outfit which had to cover all sorts of possible weather conditions, and for me it’s fun to get the Pebble Beach stuff out in May. If you can’t dress up for a Concours, you can’t dress up. The Tour was the highlight for us, moments of terror (the tire, the brakes), punctuated by 133 total miles of wonderful driving conditions and LUE at her best. The other highlight for us was the people we met, everyone from the elderly Japanese gentleman who was showing his 1961 Chevrolet Impala with 4700 original miles behind us to the great Mercedes-Benz owners next to us. 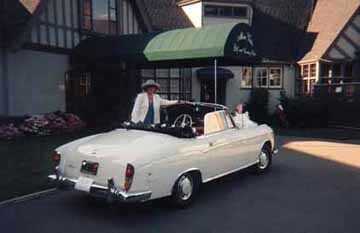 Even the British Motorcar people were nice. 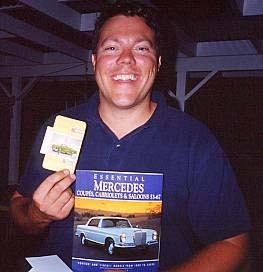 And I was most impressed by the number of Mercedes-Benz owners who came by to give LUE a real once over. 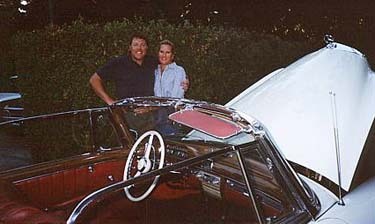 We met at least 20 people or couples that day, many of whom we have met via the International Ponton Owners Group (IPOG) internet mailing list, or at least only since we’ve had LUE. It was fun just standing there, as proud parents, and receiving everyone in turn. We were genuinely glad to see you. What a pleasure…next time we’ll try to set a meeting time so everyone can be there at once and meet each other. You are a nice group of people! All in all, a great time. It was even worth washing the car. All things considered, I may even wash the car again someday.